The lightest variant of 2019's gold bullion coins released under the Perth Mint's Lunar Series II program are now available at SD Bullion. These 2019 1/10 oz Perth Mint Lunar Year of the Pig Gold Coins celebrate the Chinese Lunar calendar, like all other coins released in the Lunar Series II. It honors the Year of the Pig in the Chinese calendar, or as we know it, 2019. A total of 12 animals rule over each year in the 12-year Chinese calendar cycle. Perth Mint's Lunar Series II has become a popular way of honoring the animals in the Chinese zodiac for not only precious metals enthusiasts across the globe, but also those who respect the famed Chinese Lunar Calendar. Those born under in the Year of the Pig are believed to be honest, loyal, sincere, and generous; they are also said to balance an easy-going nature with sincerity. 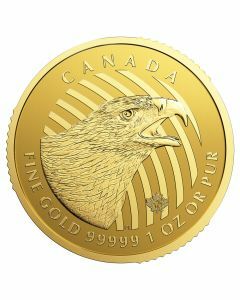 Each of these coins contains 1/10 troy ounces of 0.9999 pure gold. Moreover, they are assigned legal tender status in Australia with face values of $15 (AUD) each. The obverses of these coins display Ian Rank-Broadlety's rendition of Her Majesty Queen Elizabeth II. This is in line with all other circulating coinage in Australia -- indicating these coins' legal tender status. 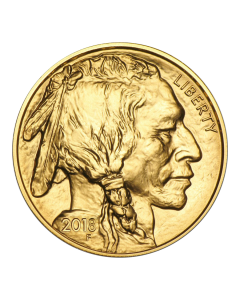 On the other hand, the coins' reverses feature the famed annually-changing designs that make every release in this series unique. To celebrate the Year of the Pig, these coins feature an adorable rendition of a pig with its snout held high. The words 'Year of the Pig' and the Chinese character for the word 'pig' accompany this image on this side. 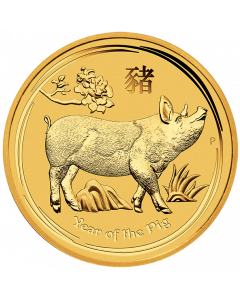 Grab these 2019 1/10 oz Perth Mint Lunar Year of the Pig Gold Coins and add to your precious metals portfolio while welcoming the Year of the Pig at the same time. What's more? You can gift them to loved ones who respect the quality and fine designs that everyone expects from Perth Mint products.